If you have enjoyed these pages or found them useful, you may like to donate. Even the smallest donation helps with the site’s running costs. Martin Seligman is responsible for the Learned Helplessness theory which had a major influence on psychological research into depression in the 1970s. 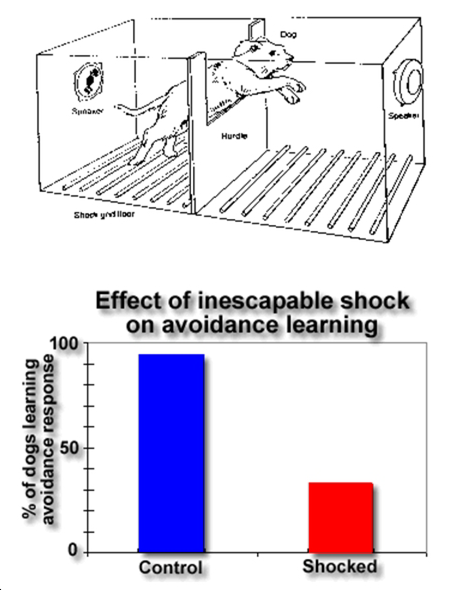 Seligman discovered helplessness by accident whilst studying the effects of inescapable shock on active avoidance learning in dogs. Seligman restrained dogs in a Pavlovian harness and administered several shocks (UCS) paired with a conditioned stimulus (CS) - this is the conventional CS-UCS pairing procedure used to study Classical Conditioning . Then these dogs were placed in a shuttle-box where they could avoid shock by jumping over a barrier. The shuttle-box was used to study the role of Operant Conditioning in learning. Most of the dogs failed to learn to avoid shock. Seligman argued that prior exposure to inescapable shock interfered with the ability to learn in a situation where avoidance or escape was possible. Seligman used the term, 'Learned Helplessness', to describe this phenomenon. It is important to emphasise that helplessness is not an all-or-none phenomenon. Seligman studied the behaviour of about 150 dogs between 1965 and 1969. About 100 (2/3rds) were helpless after the administration of unavoidable electric shock in the Pavlovian situation. The remaining 1/3rd were completely normal and learned to avoid shock in the avoidance learning test. There was no intermediate outcome - dogs either learnt to avoid, or passively accepted shock in the shuttle-box. Furthermore, about 5% of naive dogs that had never received inescapable shock, exhibited helplessness when first exposed to shock in the Operant learning situation. The central idea in the Learned Helplessness theory is the notion that all animals (including humans) are able to learn that reinforcers are uncontrollable. This marks a sharp change in direction from previous studies of learning which had focussed on learning in controllable situations (Seligman,1992). This is an extract from the page, ‘Depression & Learned Helplessness’, by Dr Paul Kenyon from his Studying & Learning Materials Online (SALMON) web site which he writes and maintains on behalf of the University of Plymouth Department of Psychology.